"Pay as You Go" trolley, is a very rare Standard Gauge Trolley (1908-1909). The narrow ceiling just did not warrant another city painting in such limited space. The viewer just has to imagine that this stop is in Chicago. The station is a Bing product made for Standard and Wide Gauge trains which has a different flavor than the Lionel stations. If you look closely, there is a transformer to the right of the station as it controls the stopping of the Trolley in front of the station for about 20 seconds before it heads back to NYC. 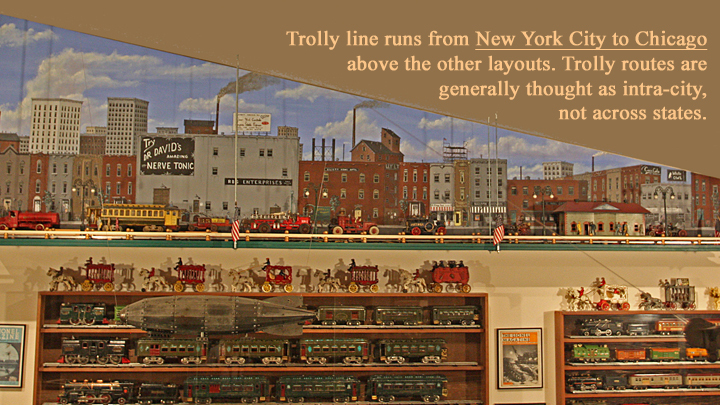 In the early 1900's mass transportation of workers and shoppers in most major cities rode on Carriages or Trolleys. 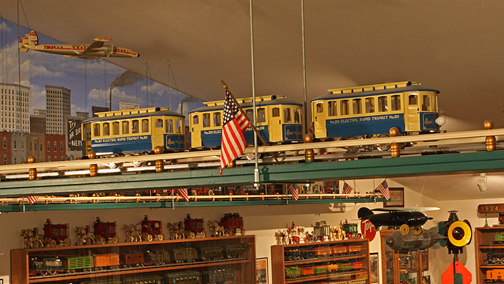 The picture shows three #100 Lionel Trolleys (re-makes in the late 1900's by Lionel). This stretch of track is about midway between stops. 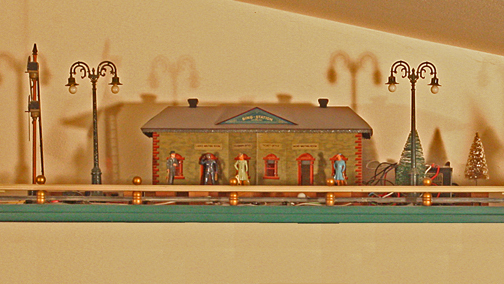 Notice the Pan Am Clipper Ship is shown over the Trolley scene, but the time period is more appropriate for the 1932 Standard Gauge layout. 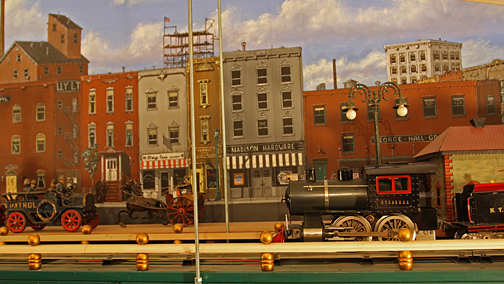 Madison Hardware was sold to Richard Kughn (the new owner of Lionel Trains in 1989). The history of Madison Hardware is legion with older train collectors (including myself) as I visited the store on 23rd Street a couple of times when I was looking for some rare parts. Unfortunately, time has a way of having limited impact of the Lionel history unless you were one who was privileged to have been there. These last two pictures show what you can do in less than 12 inches of space, and a good artist. While this is called "The Great Train Room" there are more Cast Iron toys than trains on each layout depending on scale. 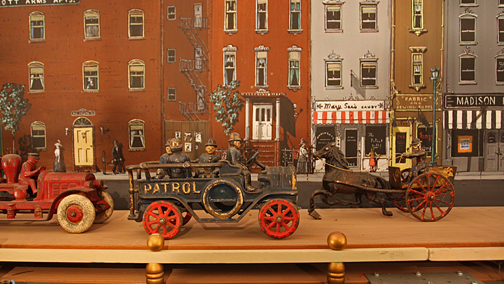 This scene depicts a NYC patty wagon who is following a horse drawn Doctor's wagon. Back in 1918 there was a mix of horse drawn carriages and wagons, Steam and electrical trolleys, and very early automobiles. Most likely no traffic lights on most roads.